Imam Sadiq (a.s.) said: O Zurarah! The sky rained blood for forty days and the earth became dark for forty days and the sun was eclipsed and turned red for forty days; the mountains were torn into pieces and dispersed and the seas gushed out and the angels wept for forty days over His Eminence (a.s.). And none of our ladies of Ahle Bayt (a.s.) dyed their hair, applied oil or Surma and combed their hair until the head of Ubaidullah bin Ziyad was sent to us; and even after that we continued to weep over him. Whenever my grandfather remembered Imam Husain (a.s.), he would weep so much that his tears moistened his beard and everyone around him also began weeping. 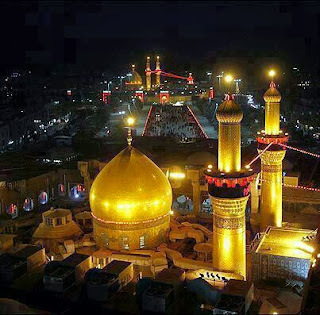 Angels near the grave of Imam Husain (a.s.) cry over him so much that every angel in the sky and in heavens cries in sympathy. When the soul of Imam Husain (a.s.) left his body, Hell protested in such a way that the earth almost split apart. When the filthy souls of Ubaidullah bin Ziyad and Yazid bin Muawiyah left their bodies, Hell roared so intensely that but for Allah containing it, using its dedicated keepers, it would have burnt everyone on earth with its outburst. And if hellfire were permitted, it would not have left anything without swallowing it. But it is restrained by shackles and controlled by orders. Hell became violent and uncontrollable more than once, until Jibraeel went to it and pacified it with his wings. The Hell cries and laments over Husain (a.s.) and its fire blazes on his killers. If it was not for the presence of Divine Proofs of Allah on the earth, it would have destroyed the earth and overturned everything on it. But earthquakes will increase only when Qiyamat is near. There are no eyes and tears loved more by Allah than the eyes of those who cry and shed tears over Imam Husain (a.s.). And there is none who cries but that his crying reaches Lady Fatima (s.a.) and he supports her in her lamentation, and his crying also reaches the Holy Prophet (s.a.w.s.) and in this way he fulfills our rights. But they will not even turn to the Houries due to the joy and honor they feel in their gathering. B: Those who will cry out, “So we have no intercessors, nor a true friend;” (26:100-101). Then some precious saddled mounts will be brought for them which they will ride to their abodes, praising and glorifying Allah and invoking blessings on Muhammad and Aale Muhammad (a.s.).